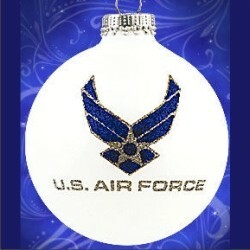 This air force glass ball personalized Christmas ornament is an attractive and fitting way to recognize the airmen and women you count among your family and friends. We'll add the name and rank of the recipient above the Air Force insignia emblazoned on one side, and we'll hand paint your personal message of gratitude or encouragement on the opposite side. Choose the Air Force glass ornament to honor a new enlistee, the attainment of a new rank or even retirement after a distinguished career. This is just one of our Air Force ornaments personalized with specific details to create a lasting keepsake. Awesome! Nov 7, 2014 Darlette B.